The Zoanthids Trifecta Acropora has a couple of very interesting qualities. 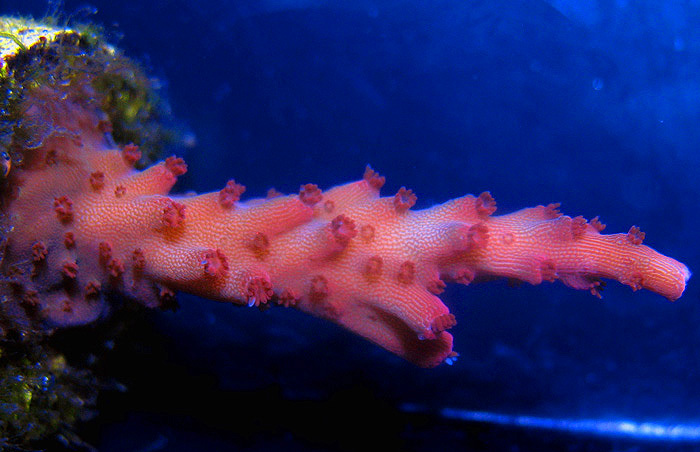 The first being the red pigmentation that develops near branch tips and corallite walls. An unusual pigment pattern develops where the reddish pigments appear much brighter when the frag is viewed from the end of the branch. This gives the coral frag a more or less red flashlight like illumination pattern. With the red/pink pigments concentrated towards the end or tip. The pigment is most intense under Royal Blue LED lighting and the UV light image below illustrates the actual pigment and its distribution pattern. 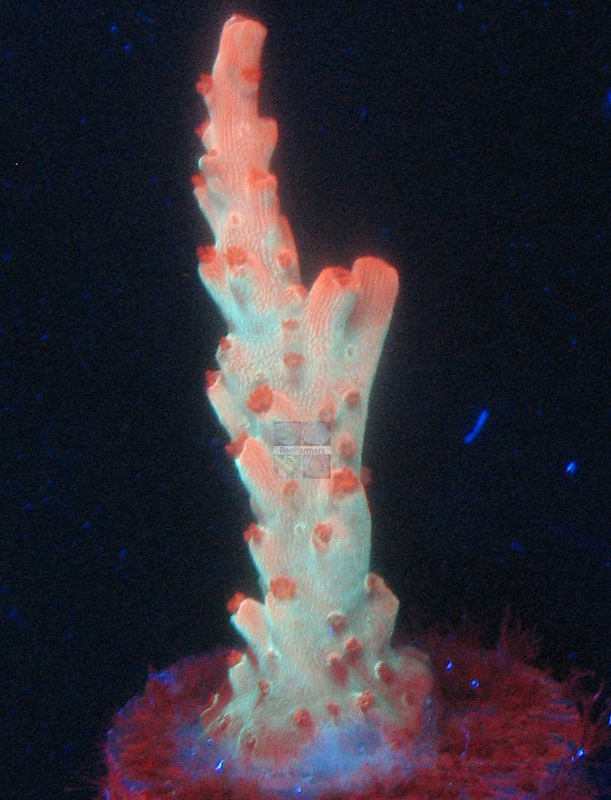 The other unique quality of this coral is its colorful polyps that have red tentacles with a multi color pink polyp center. Polyps also extend one elongated whitish colored tentacle. Reeffarmers acquired our seed direct from Brandon with Zoanthids during the Front Porch Friends Coral Show in Leeds Alabama in April 2016. Brandon usually has a couple of Acropora frags in his display system. He farms a few species that develop very good coloration under LED lighting. This one caught Reeffarmers eye during the coral show. The reddish pink pigmentation pattern development was unusual and interesting. We acquired our seed and first edition fragments right on the spot during the show. The two Acropora frags were healthy enough to make it back to our Texas facility in very good shape. Reeffarmers is maintaining a seed section of this coral in a 8 foot Raceway Gyre BiZonal system. This system is naturally filtered with a semi-cryptic zone and a reef flat exposed zone. In this captive reef the coral is positioned to receive moderate light and moderate water current. The first edition fragment of this coral is being offered for sale and will be listed on Reeffarmers Buy it Now web page shortly. List price for the small fragment is $125. Reeffarmers is also growing out a fresh cut tiny second edition fragment. Please email for info. Page text updated on April 24th 2016.